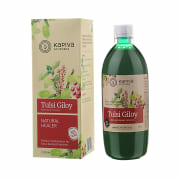 Kapiva Tulsi Giloy Juice contains extracts of Tulsi and Giloy as ingredients. Treats recurrent fevers and helps reduce the signs and symptoms of swine flu, dengue, and malaria. Effective against body-aches and headaches. Acts against viral infections that result in a severe cough and cold. Helps improve digestion, lowers blood sugar level and improves vision. Drink 50 ml of juice mixed with a glass of water twice a day or as directed by the healthcare professional. Always read the entire label before use. A licensed pharmacy from your nearest location will deliver Kapiva Ayurveda Tulsi Giloy Juice. Once the pharmacy accepts your order, the details of the pharmacy will be shared with you. Acceptance of your order is based on the validity of your prescription and the availability of this medicine.